GCN is committed to preventing gun violence and we work to pursue that objective through changes to the legal system, public services, and attitudes to guns. We collect and analyse data to provide all stakeholders with the evidence needed to initiate change. A 72-year-old man received fatal head injuries after a shotgun discharged as he was cleaning it at his home in Shamley Green, Surrey. Police and paramedics were called but he was pronounced dead at the scene. A 26-year-old man has been shot dead with a shotgun as he sat in his car outside a shop in Southwell, West London. The gunman pushed the shotgun through the window and fired twice at close range, before escaping in a stolen car with cloned number plates. An inquest recorded a unanimous verdict of suicide in the case of a 35-year-old man who shot himself at his home in Hungerford, Shropshire in December 2016. Armed police were deployed after the man’s partner reported his threats to kill himself. The IPCC investigation found that the officers had followed national guidance and considered the safety of everyone who was there that night. N.B. The inquest failed to reveal whether or not the shotgun was legally held by the deceased. Gun Control Network believes the victim was a licensed gun owner. Armed police attended after reports of a firearm discharge at an address in Stourbridge, West Midlands. Two men were taken to hospital with gunshot injuries. Police said that all those present knew each other. A 64-year-old man from Stoke-on-Trent, Staffordshire, has been sentenced to eighteen months in prison, suspended for two years, with a rehabilitation activity requirement of twenty days, for possession of an imitation firearm with intent to cause fear of violence and making threats to kill, after his partner ended their relationship. A 21-year-old man from Wrexham, North Wales, has been jailed for fifteen months after admitting to using controlling and coercive behaviour in a personal relationship; including threats to kill, punching and throttling, and shooting the victim in her leg with a gas-powered gun. A 21-year-old male suffered non-life-threatening injuries, believed to have been caused by a firearm, in Hirwaun, South Wales. The suspect was later found by police and taken to hospital for treatment for a serious head injury. A police spokesperson said that the parties were known to each other. A 29-year-old man has been jailed for 27 months after he admitted possessing an imitation firearm with intent, and two charges of making threats to kill. The perpetrator sent threatening messages to his ex-wife and her mother, and fired a ball-bearing gun at the home of his ex-wife’s parents in Wickenby, Lincolnshire. A 22-year-old man has been jailed for two years after pleading guilty to possessing an imitation firearm with intent to cause fear of violence. The perpetrator pointed a blank-firing pistol at residents of the YMCA in Mansfield, Nottinghamshire, where he was staying. See Gun Deaths above 72-year-old man with fatal head injuries. See Inquests above 35-year old man who took his own life. A 68-year-old man, a gun dealer from Ashbourne, Derbyshire, has been jailed for twelve years following a police investigation into an underground guns and drugs network in the West Midlands. The perpetrator shortened barrels and removed serial numbers from shotguns before supplying them to organised crime groups. When armed police stopped his vehicle, they recovered ten sawn-off shotguns and 250 cartridges. Three men have been injured by shotgun fire during a gun dog trial in the grounds of Carnanton House at Mawgan, Cornwall. No arrests have been made as the injuries were deemed to be accidental. A 66-year-old man, a gun dealer from Hardwicke, Gloucestershire, has been found guilty of supplying illegal weapons and ammunition to criminals. The gun dealer’s weapons and homemade bullets have been linked to more than 100 crime scenes including three murders. Some 500,000 rounds of ammunition and seventeen guns were recovered but police believe that more than 200 imported weapons, claimed by the dealer to be obsolete antiques to sidestep import rules, are still in circulation. A 74-year-old man, said to be interested in military history and believed to be a licensed gun owner, has been jailed for five years after a dangerous hoard of 160 firearms and ammunition was found by firefighters called to his home in Gillingham, Kent. Three cats have been injured in what are believed to have been airgun attacks in a number of locations including Lincolnshire, West Yorkshire and Cornwall. Imitation, Airsoft, and BB guns do not currently require a licence in England or Wales. These guns are responsible for many gun injuries to both humans and animals. Airgun owners in Scotland are required to have a licence as of January 2017. A five-strong gang has been jailed for a total of 50 years after they imprisoned and tortured a man who had come to buy drugs from them at a house in Gainsborough, Lincolnshire. A 25-year-old man has been sentenced to a 24-week jail term suspended for two years after he threatened to shoot and kill staff and members of the public with a BB gun in the A&E department of a hospital in Burton, Staffordshire. He must also pay £100 compensation, £50 court costs, a £115 victim surcharge and complete an alcohol treatment requirement for his alcohol dependency, and a rehabilitation activity requirement. A 30-year-old man has been sentenced to a twelve-month community order with a requirement to carry out 120 hours unpaid work after pleading guilty to shooting a four-year-old boy in the throat with an airgun that he believed to be empty of pellets. The boy and his mother were at a birthday party at the perpetrator’s home in Shepton Mallet, Somerset when he aimed the gun at the boy to ‘cheer him up’. Three men have been jailed for a total of 52 years after being found guilty of attempted murder. The men, armed with a shotgun and knives, attacked a 42-year-old man on a crowded street during a carnival in Leeds, West Midlands. A 19-year-old man has been sentenced to ten years and eight months’ imprisonment after pleading guilty to one count of possession of ammunition with intent to endanger life and three counts of possession of a firearm with intent to endanger life. Officers carrying out a drugs warrant at a property in Stonebridge, North West London as part of an ‘intelligence-led’ operation, discovered three loaded guns and ammunition of a lethal bullet type that expands upon impact. A 26-year-old man of Cullompton, Devon has been found guilty of possessing a firearm with intent to cause fear of violence after he pointed an air rifle out of his van window causing the driver of another vehicle to fear it would be fired. A 37-year-old man from Stoke-on-Trent, Staffordshire has been jailed for eighteen months after pleading guilty to possessing an imitation firearm with intent to cause fear of violence. The perpetrator pointed the gun at cars travelling along the road on which he lives. Many incidents involve the use of airguns*, Airsoft, imitation, and BB guns which do not require a licence and may not contain ammunition, but are used by perpetrators to capitalise on the fear of victims who believe they are about to be shot. Traumatised victims are often unable to identify the weapons used. It is extremely difficult to distinguish between imitations and live-firing guns unless the weapons are fired and/or recovered, and for this reason guns involved in incidents frequently remain unidentified. Shotguns and rifles can be legally held by those granted a licence. Ultimately, legally-obtained guns in every country tend to find their way into the wrong hands, whether through theft, corrupt licensed gun dealers, (See above Licensed Gun Owners/Dealers/Legal Guns and Ammunition) and/or the failure of the licensing procedure to identify legal gun owners who pose a risk to themselves and/or others. Guns that do not require a licence: Airguns* (so-called ‘low-powered’) Airsoft; ball-bearing; imitation; paintball; antique and deactivated guns; bolt guns** and starting pistols/blank firers. These guns are cheap, accessible, and available to buy on impulse. Moreover, lack of secure storage requirements enables theft. Many are capable of being converted into more powerful weapons. Guns deactivated to early specifications are capable of reactivation and recent more rigorous specifications are not retrospective. N.B. 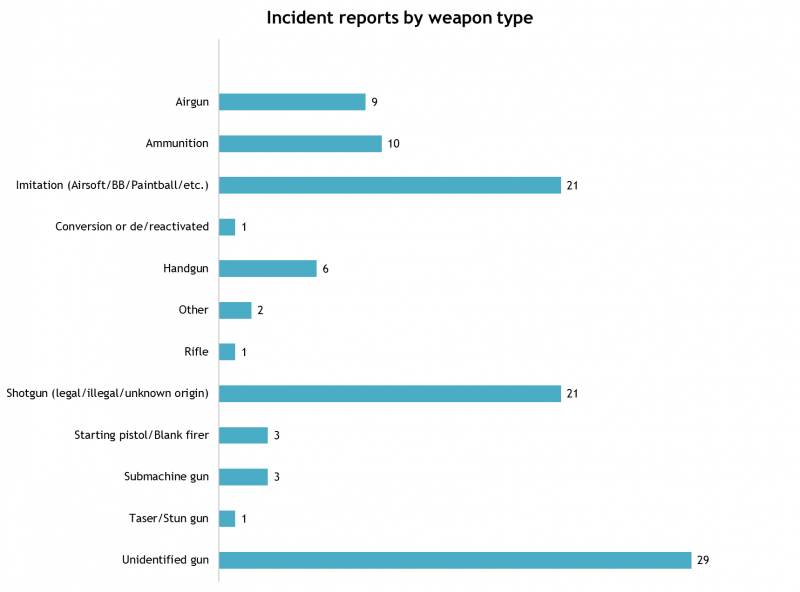 The Office of National Statistics has published data relating to 2015 which demonstrate that over 80% of offences involving imitation firearms involved BB guns or soft air weapons. *From January 2017 airgun owners in Scotland require a licence. The inadequate licensing procedure is subsidised by taxpayers to the tune of £20 million a year. Any number of shotguns can be held on one certificate, which lasts for five years. The licensing procedure consistently fails to protect the public from licensed gun-owning perpetrators. Women are particularly at risk of domestic violence involving licensed gun owners. However, the Home Office does not publish data regarding the number of licensed guns/legal gun owners involved in crime, and the status of guns used in suicides is not recorded at inquests. Certain handguns are exempt from prohibition. Handgun, Taser, and pepper spray use is authorised for police, but there are concerns regarding fatalities and Taser training.